We’re looking at “One Verse Wonders” this Fall. These are one sentence statements that teach us about the wonders of our faith. They’re verses that have had a lasting impact upon our faith. They have shaped our faith and countless lives. “One Hit Wonders” in music are singers who had one hit song and then are never heard from again. One Verse Wonders never go out of style. They continue to be heard. They continue to speak. 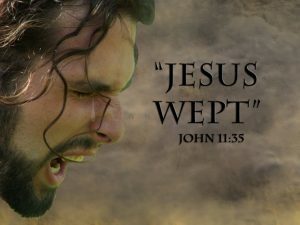 So in the original Greek, “The second” has fewer letters than “Jesus wept.” I really need to research before I speak! Of course, the verse divisions are not in the original manuscripts. They were added in the 1551 to make it easier to find, refer to and study various passages. It’s also used sarcastically to express indifference to someone else’s misfortune. It is commonly used as an expletive in Stephen King novels. It’s been used in a long list of books, television shows and movies, including Lawrence of Arabia (1962). This is another example of how a fallen world takes something absolutely beautiful and makes a mess or a mockery of it. But let’s get to the heart of the issue today. Why is this verse so special? 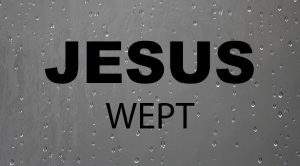 “Jesus wept.” What’s so special about the fact that Jesus wept? It shows the empathy of Christ – he understands our grief, our losses, our hurt and our pain. He understands the sting of death. He understands and cares about our heartaches. He knew he was going to raise Lazarus from the dead, but he still grieved over the heartache of grief. 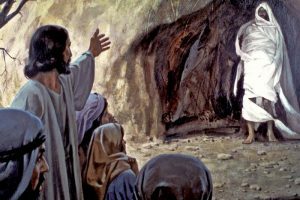 Jesus certainly fulfilled that prophesy – not only through the suffering of the Cross, but also how he responded to the loss of his dear friend Lazarus. 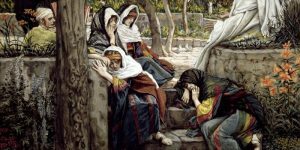 Jesus was “acquainted with grief.” He wept. This passage shows that our Savior is not immune to our suffering! 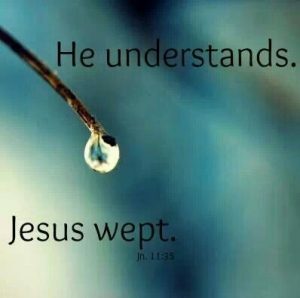 Christ understands our grief! 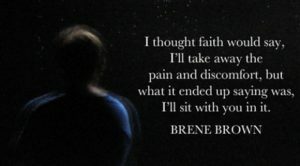 I’d like us to spend a few minutes this morning thinking about grief. Grief is a subject we all have faced or will face, and yet we talk so little about it. Let’s take a look at two hand-outs. The first comes from the training I received to become a Life Coach for the Dying and Grieving. “If you want to live well and love well . . .
No one can help you with your grief. Moving on with your life means forgetting the one you lost. This next hand-out comes from my 20+ years of facilitating grief support groups. A. The power of shared experience means that the people who will be most helpful to you are those who’ve been through it. B. Good-hearted people will try to take your grief away. C. Good-hearted people will say the dumbest things. D. Life will not feel safe for a while, like living on An earthquake fault line. E. People often hit emotional valleys in 3-month intervals. F. People can get stuck or mired down in one of the emotions of grief for a long time. Especially anger and depression. Often anger gets directed or channeled at someone – ex. doctor, nursing home, funeral director, pastor, etc. G. The week leading up to an anniversary/holiday/birthday is often more difficult than the day itself. H. In the early months, grief is like the stock market in decline, in a “bear” market. It usually gets worse before it gets better. I. Farther along, the journey of grief is like the stock market ascending in a “bull” market. The dips or downturns are farther apart and often not as deep. K. A number of people speak of “signs from their loved ones, even visitations. L. Faith and a faith community are invaluable resources. I’ll close with a story from Elizabeth Kubler-Ross, the pioneer on the journey of grief. And that’s where we need to be – for ourselves and for others.